If you are looking for a good idea for a fun night at home with some friends, then why not through a murder mystery dinner party? It has all the essential elements of a fun time – good friends, good food, cool costumes and a murder for every guest to solve! These types of things usually tend to work best in groups of 6 to 8 dinner guests, but they can really be of any size. It helps if you have friends who do not mind doing a little acting all in the sake of a good time. So, do not invite that one friend everyone has who can’t keep a secret, cause if she is the villain of the game, then EVERYONE will know, right? To help you get started with a successful night of fun with your friends, I have take out the time and selected my favorite murder mystery party game kits. Take a look at them below to get some great ideas for the night. If you do not mind a bit of a spoiler, you can get an ‘at a glance’ view of the best games for a get together of this type right above here. And the five that are featured below are that ones that are not only the best selling but also the highest rated by other party goers and planners. So, you can keep reading below for more information or just click on the game that is of interest to you to be taken directly to its product info page. There you will find detailed info on the game including real reviews from people who have purchased or played the game. Enjoy! If you and your friends enjoy good wine and good food, then this murder mystery dinner party game kit is the perfect choice for you. The kit comes with a complete character breakdown so that every one can get into their character. You also get a CD that serves as an introduction and offers the solution to the murder mystery. It even comes with a menu and recipes to really set the mood for your dinner party. A total of 8 party invitations are included with this game. Designed for a total of 6 to 8 party guests. If you are having a dinner get together with friends that is centered around pasta and great Italian food, then this murder mystery dinner guest game is for you. When you buy this murder mystery game kit, you get a sample menu with recipes as well as invitations for up to 8 guests. The game is designed to work best with between 6 to 8 dinner guests. Also included is a CD that gives you the introduction and clues before wrapping up the mystery. And a character booklet gives you and your guests everything that you need to know for preparing for your role in the murder mystery. If you can’t make it to New Orleans for Mardi Gras, then this murder mystery dinner game is the next best way to celebrate. Designed for 6 to 8 dinner guests, this murder mystery game is a great way to spend a few hours with your friends. You get a menu for a Mardi Gras style meal, including recipes. Also in the murder mystery kit is a character booklet so that everyone can get background info on their character, and a CD that gives everyone the introductory clues as well as the conclusion of who among you is the murderer. Want to have a memorable dinner with friends while firing up the grill? If so, you need to check out this cool murder mystery dinner game that let’s you make the cookout part of the fun. Get together 6 to 8 dinner guests and get ready to solve a good old fashioned murder. The dinner game kit comes with a menu, recipes, invitations, character background booklet and game instruction CD. 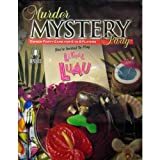 Another great dinner game theme for the warm months is right here with this luau murder mystery dinner game kit. With this game kit, you get a menu, recipes for delicious luau dishes, an instructional CD that also holds the key to who is the murderer, invitations, and a character booklet. The game is designed for dinner guests of 6 to 8 people. So call up your friends and get ready for a fun time! If you want to have a little fun with your murder mystery dinner guests, you can use some crime scene tape to decorate for the occasion. This can not only be a really cheap way to decorate the exterior of the house, but also a really fun way. You can put the tape on the front door, on the mailbox, on the porch or anywhere else that you desire. Of course, if you have neighbors then you might want to give them an explanation before you do it. Otherwise, you will have everyone thinking that a crime happened at your house. And you may even get some gawkers who come up to the house to see what exactly is going on. Of course, that could lead to some pretty funny conversations with the neighborhood!